ISR's five directors attended the reception. 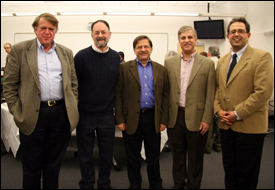 Left to right (in order of their dates of service): Founding Director John Baras, Steve Marcus, Gary Rubloff, Eyad Abed, and current Director Reza Ghodssi. ISR held a special reception Dec. 4 to thank and honor Eyad Abed (ECE/ISR), for his more than six years of service as director. Eyad is one of the original faculty members of the institute and is ISR’s fourth director, following founding director John Baras, Steve Marcus, and Gary Rubloff. Eyad became the acting director of ISR on September 1, 2001, and was appointed as ISR director on Nov. 4, 2002. He held this position for more than six years, through August 31 of this year, when he began a new position as dean of the College of Information Technology at United Arab Emirates University. He is maintaining formal ties to the University of Maryland and ISR and is working toward establishing a research partnership between the two universities in information technology and related areas. • Eyad designed and implemented the ISR seed grant program. Seed grants have produced significant follow-on benefits including subsequent funding awards and joint publications, as well as student and post doc funding. Seed grants also fostered the formation of diverse research groups that are still collaborating. • Eyad reinvigorated ISR’s international research agreements. Ten of these have been initiated, and the resulting collaborations include exchange of researchers; post doc hiring; faculty serving on Ph.D. committees; joint technical papers; joint funding; and joint proposals. • Eyad led the revision of ISR's Masters degree programs in Systems Engineering, with input from systems engineering leaders in government and industry. • Eyad was instrumental in bringing to our faculty two significant colleagues: Marvin Sambur as Professor of the Practice, and Carl Landwehr as a Senior Research Scientist. • Eyad established ISR’s Distinguished Lecturer Series, bringing 28 distinguished systems engineering experts to us over the years. • Eyad played a large role in establishing the joint ISR and ECE computing facilities, which both saved money and improved service. Thank you, Eyad, for your dedication to ISR, and we wish you all the best in your new position!